About Beautiful Living by Laurel T. Colins. Interior Decorator, Paint Color Consultant in Vancouver, Nelson, BC. Lauel T. Colins is a styling and decorating consultant specializing in spatial orientation and positive energy flow within physical enviroments. With over three decades of experience she has developed a keen sense and a strong intuition that enables her to fully support the needs of her clients. 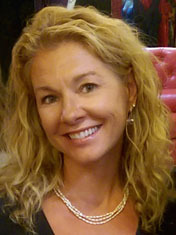 She uses a variety of practical hands on methods including colour placement, principals of Feng Shui and elemental design theories that complement her unique, and intentional, decor and design services. In addition to being a professional stylist and decor consultant Laurel is also an international best selling author, a workshop facilitator and the proud mother of two amazing daughters, one of which is a successful Fashion Designer. A great way to get to know someone is to see how they live. Check out my Instagram to see what i see in my life and how i find beauty in my world. It's fun too! I started my working life as a hairdresser, where I learned the importance of clear communication. Effective listening of the hairdresser to the client is essential. Hairdressing led me to the film industry where I added make-up artistry to my resume and then transitioned into a 20 year career as a professional wardrobe stylist for television commercials. I worked with countless directors, advertising agencies and corporate clients such as JEEP, Kelloggs, and Hasbro. During this time I honed my communication skills and ability to interpret my clients needs and help them find and create their vision. It was during my Film Biz days that I began learning about Feng Shui. When my kids were six and eight I move back to Nelson BC for a change of lifestyle. I wanted to have more time home with my family. My career and passion has always been around creating beauty and style and naturally that includes decorating and by this point I had had my own home featured in Canadian Home and Country Magazine Cottage Style edition. I began working as a decorator here in Nelson, eventually went to work in a Furniture and Home Décor Store where I became a furniture, decor and bedding expert. I was also the merchandiser and buyer for the store and I had the opportunity to travel internationally to shop for the store. While working as a Decorator, I decided I wanted to know more about how to make the decorating experience more profound and beneficial for my clients and so I travelled to California to study at The Western School of Feng Shui. Four years ago I had another lifestyle change when my position at the store ended and I launched on to a journey of self development and self discovery. I have had the pleasure of training with many great coaches and Mentors. I have created my own 7 step system for transformation, I am a best-selling author and contribute regularly to Kootenay House and Home and Bride magazines. Laurel's expertise made my heart sing! It's not just about the paint on the walls, it's more about the colours that make your personality and heart a part of your home. Laurel's expertise with colour and design made my heart sing. Laurel T. Colins is a reliable interior decorator and stylist, specializing in interior decoration, photography styling, feng shui, paint color consultation. Consult Beautiful Living by Laurel T. Colins for full-service interior design services across Vancouver, Nelson, Kaslo, Rossland, Trail, Nakusp, Balfour, Creston, West Vancouver, North Vancouver, Burnaby.